Submit your claim from the airport. Download our app now! You could receive up to €600 if your flight is delayed, canceled, or you were denied boarding. We handle your claim on a “No Win, No Fee” basis. Just submit your claim on the app and we’ll make sure you receive the compensation that is rightfully yours. You need to download our app to do this. Thousands of customers have benefited from this app so far! Don’t forget to check on past flights! The latest European regulations entitle you to claim compensation for delayed or canceled flights dating back several years (as well as some denied boarding domestic flights). Download the AirHelp app to check past flights! Get compensation when your travel plans don’t go as planned. If you’ve been on a delayed, canceled, or diverted flight in the last three years, the airlines might owe you money for your troubles. 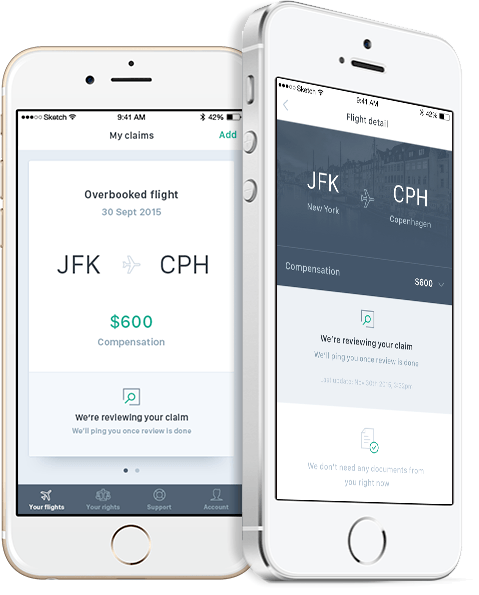 Check with AirHelp to see if your flight qualifies for compensation.